The Resource Assistants Program (RAP) is a rigorous, immersive, paid internship for individuals interested in careers with the U.S. Forest Service. Resource Assistants (RAs) work under the supervision of Forest Service staff to complete mission-critical work that demonstrates leadership, critical thinking, and strategic communication. Through direct training, experience, and exposure, Resource Assistants gain the tools to launch their natural and cultural resource careers. After completing a minimum of 960 hours of satisfactory work on a qualifying Forest Service project, and receiving an associate degree or two-year post-secondary certification, Resource Assistants may acquire a special hiring authority for up to two years to apply to permanent positions open to Forest Service employees. The Corps Network is one of several national organizations that work with the U.S. Forest Service to recruit Resource Assistants. This partnership model allows the U.S. Forest Service to reach a diverse pool of applicants across the country. 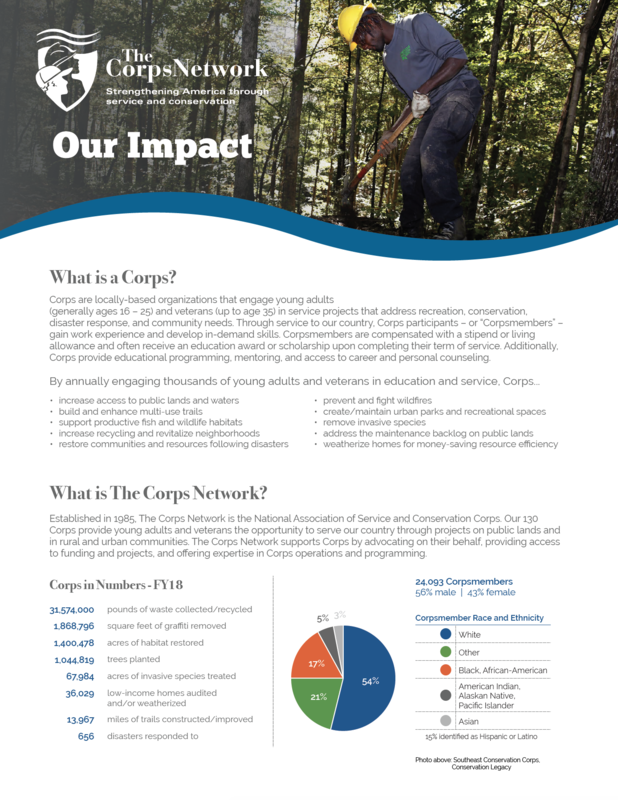 Among the other organizations that partner with the U.S. Forest Service on recruitment are several Member and Affiliate organizations of The Corps Network, including Conservation Legacy—Environmental Stewards; Conservation Trust for North Carolina; Greening Youth Foundation; MobilizeGreen; and Northwest Youth Corps. Open RA positions are generally shared by the partner organization that is handling the recruiting. Positions for which The Corps Network is recruiting can be found on our Jobs at Corps page. Forest Service units identify work experiences that are at a GS-04 level or above that allow for meaningful contributions to the Forest Service mission. The Corps Network invites Accredited Corps to work with interested Forest Service sites to recruit qualified, diverse candidates. The Accredited Corps will provide the Forest Service with a list of top candidates. Interviews and final selections are made by the Forest Service unit.